When designing and realising business applications and Internet sites, there is relatively much attention to trends, details and technical possibilities. The wishes and expectations of the user are often poorly considered. And that's a shame, because now that technology knows little to no limitations, it is possible to put the user central. Naturally, in the development of every application, website or other application, the user is given some consideration. But, in many cases, this leads to no more than a limited description of his functional role. For example, the 'marketing manager of company Y' or the 'inhabitant of the municipality of X'. Who exactly that marketing manager or inhabitant is, what his knowledge, competences, expectations and wishes are, is often not described. The result? The idea of the user remains diffuse and abstract. Everyone who is involved in this project will give it his own interpretation, based on their own experiences and background. This greatly increases the chances of confusion during a project. Moreover, it leads to superior solutions on paper only having limited added value in practice. Even if they have been created perfectly in terms of technology and design. Users of the Internet or software are always more than their defined roles in a flow chart of the ICT design. No one can be simply reduced to 'marketing manager of company Y' or 'inhabitant of the municipality of X'. Users are always people of flesh and blood, man or woman, with a certain age, certain knowledge, work pattern, experience etc., etc. It's important to take this into account when developing Internet and software application. The best way to do this, is by thinking about the characteristics of users at the beginning of the project. What are their expectations of the application or website? What are their obstacles? How would they like information to be offered? What is their experience with certain type of software? There are various methods available to determine the characteristics of users. From extensive market research to small-scale brainstorming sessions. At Iquality, we use personas or an empathy map. Personas are very suitable to quickly obtain a good idea of the users. By means of a brainstorming sessions, you create fictitious people who will use your application or website. As concrete as possible. So with a brief bio. And with a picture or drawing. You do this together, so everyone who is involved in the project will subsequently have the same, well-formed idea of the user. In all decisions, from functional design to graphic design, you subsequently look the personas in the eyes. What would they think? Why? What would they like to change? 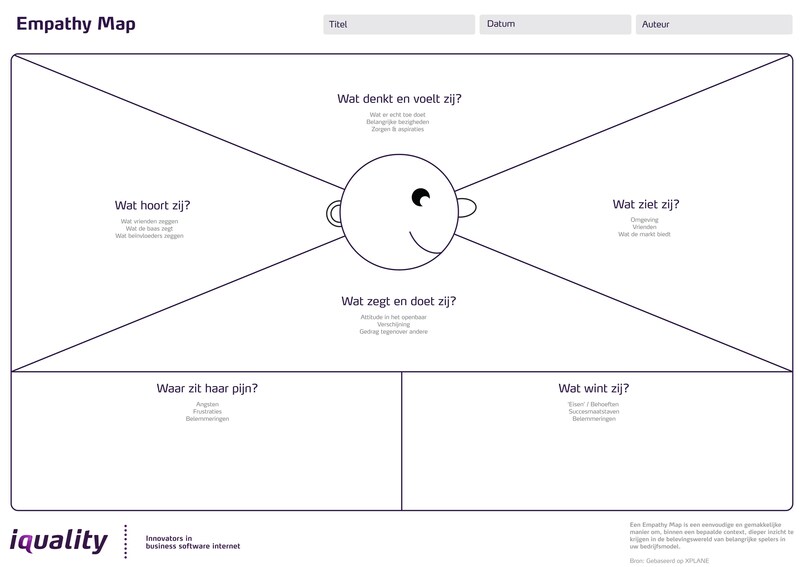 An Empathy Map is a simple and easy way of, within a certain context, gaining deeper insight into the experience world of important players in your business model. An empathy map gives direction to the total marketing strategy of a company. The idea was developed by Dave Gray and further expanded by Alex Osterwalder. A large poster lists questions about the customer: What does he think and feel? What does he hear? What does he see? What does he say? What doesn't he say? Where is his pain? What is his motivation? During brainstorming sessions, these questions are answered with post-its. It is important to make the image created of the customer as lively as possible. So with a picture or drawing. Whatever method you choose, it's important that you look at the users together in a well-substantiated way at the start of the project. In doing so, you make sure that you make the right decisions during later phases. And a well-substantiated and unambiguous idea of the user, also simplifies these decisions. How do you easily and quickly map all stakeholders?